This site will never be a large one and all the jewelry here within this site is hand made and not mass produced. All are one of a kind made by little old me. I hope you enjoy each piece of jewelry as much as I did making them. If you are interested in a custom item made for you please contact me and I will work with you to design something that you will wear with pride. The best advertising is word of mouth, so below we might include some comments from our satisfied customers. If you have any comments good or bad please don't hesitate to let me know, and if you wish I will put the comments here for all to see. 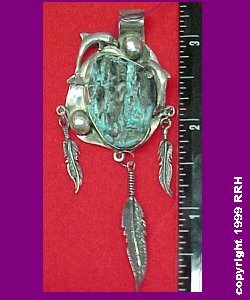 This pendant is silver and the turquoise is the seafoam variety. There are silver dolphins which add a nice touch to the turquoise. There are 3 silver feathers that dangle on this unique one of a kind pendant. Any ? or comments just email.